This text was copied from Wikipedia on 18 January 2019 at 6:02AM. Many Romans at the time, led by Populares politicians Gaius Julius Caesar and patrician turned plebeian Publius Clodius Pulcher believed that Cicero's evidence against Cataline was fabricated and the witnesses were bribed. This was done in a concerted effort by Optimate politicians to prevent social changes in Rome, both the city and throughout the Roman Empire. Cataline had campaigned for and lost the office of Consul four times in as many consecutive years, the last being in 63 BC, the year of Cicero's consulship, for the year 62 with support from the Populares. Cicero, who had been elected Consul with the support of the Optimates, promoted their position as advocates of the status quo resisting social changes, especially more rights for the average inhabitants of Rome. In 60 BC, Julius Caesar, invited Cicero to be the fourth member of his existing partnership with Pompey and Marcus Licinius Crassus, an assembly that would eventually be called the First Triumvirate. Cicero refused the invitation because he suspected it would undermine the Republic. In 58 BC, Publius Clodius Pulcher, the then tribune of the plebs, introduced a law (the Leges Clodiae) threatening exile to anyone who executed a Roman citizen without a trial. Cicero, having executed members of the Catiline Conspiracy four years previously without formal trial, and having had a public falling out with Clodius, was clearly the intended target of the law. Furthermore, many believed that Clodius acted in concert with Julius Caesar who feared that Cicero would seek to abolish many of Caesar's accomplishments while Consul in 59 BC, whom he did not support. Cicero argued that the senatus consultum ultimum indemnified him from punishment, and he attempted to gain the support of the senators and consuls, especially of Pompey. When help was not forthcoming, he went into exile. He arrived at Thessalonica, on 23 May 58 BC. In his absence, Clodius, who lived next door to Cicero on the Palatine, arranged for Cicero's house to be confiscated by the state, and was even able to purchase a part of the property in order to extend his own house. After demolishing Cicero's house, Clodius had the land consecrated and symbolically erected a Temple of Liberty (aedes Libertatis) on the vacant spot. Cicero's exile caused him to fall into depression. He wrote to Atticus: "Your pleas have prevented me from committing suicide. But what is there to live for? Don't blame me for complaining. My afflictions surpass any you ever heard of earlier". 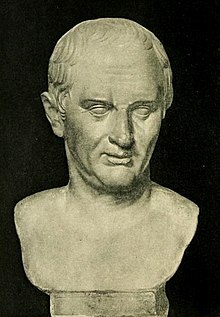 After the intervention of recently elected tribune Titus Annius Milo, the senate voted in favor of recalling Cicero from exile. Clodius cast the single vote against the decree. Cicero returned to Italy on 5 August 57 BC, landing at Brundisium. He was greeted by a cheering crowd, and, to his delight, his beloved daughter Tullia. 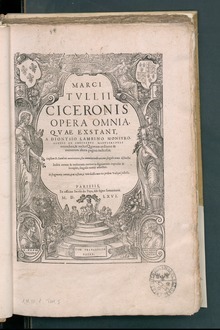 In his Oratio De Domo Sua Ad Pontices, Cicero convinced the College of Pontiffs to rule that the consecration of his land was invalid, thereby allowing him to regain his property and rebuild his house on the Palatine. In 51 BC he reluctantly accepted a promagistracy in Cilicia for the year, because there were few other eligible governors available as a result of a legislative requirement enacted by Pompey in 52 BC, specifying an interval of five years between a consulship or praetorship and a provincial command. He served as proconsul of Cilicia from May 51 to November 50 BC. He was given instructions to keep nearby Cappadocia loyal to the King, Ariobarzanes III, which he achieved 'satisfactorily without war.' Rome's defeat by the Parthian Empire and an uprising in Syria caused disquiet in Cilicia. Cicero restored calm by his mild system of government. He discovered that much of public property had been embezzled by corrupt previous governors and their staffs, and did his utmost to restore it. Thus he greatly improved the condition of the cities. He retained the civil rights of, and exempted from penalties, the men who gave the property back. Besides this, he was extremely frugal in his outlays for staff and private expenses during his governorship, and this made him highly popular among the natives. Previous governors had extorted enormous sums from the provincials in order to supply their households and bodyguard. Besides his activity in ameliorating the hard pecuniary situation of the province, Cicero was also creditably active in the military sphere. Early in his governorship he received information that Pacorus, son of Orodes II the king of the Parthians, had crossed the Euphrates, and was besieging Cassius (the interim Roman commander in Syria) in Antioch. Cicero marched with two legions and a large contingent of auxiliary cavalry to Cassius' relief. He ambushed and defeated a large troop of Parthian horsemen while Cassius defeated Pacorus himself. Cicero next defeated some robbers who were based on Mount Amanus and was hailed as imperator by his troops. Afterwards he led his army against the independent Cilician mountain tribes, besieging their fortress of Pindenissum. It took him 47 days to reduce the place, which fell in December. Then Cicero left the province to his brother Quintus, who had accompanied him on his governorship as his legate. On his way back to Rome he stopped in Rhodes. He then spent some time in Athens, where he caught up with his old friend Titus Pomponius Atticus and met men of great learning. In Pompeii, a large villa excavated in the mid 18th century just outside the Herculaneum Gate was widely believed to have been Cicero's, who was known to have owned a holiday villa in Pompeii he called his "Pompeianum". The villa was stripped of its fine frescos and mosaics and then re-buried after 1763 – it has yet to be re-excavated. However contemporaneous descriptions of the ruins combined with Cicero's own references to his Pompeianum differ, making it unlikely that it is Cicero's villa. ^ Wootton, David (1996). Modern Political Thought: Readings from Machiavelli to Nietzsche. Hackett Publishing. p. 1. ISBN 978-0872203419. Retrieved 27 August 2013. ^ Wood, Neal (1991). Cicero's Social and Political Thought. University of California Press. ISBN 978-0520074279. ^ Griffin, Miriam; Boardman, John; Griffin, Jasper; Murray, Oswyn (2001). The Oxford Illustrated History of the Roman World. Oxford University Press. pp. 76ff. ISBN 978-0192854360. Retrieved 10 August 2011. ^ Vasaly, Ann (1993). Representation: Images of the World in a Ciceronian Territory. Berkeley: University of California Press. pp. 158–68. ISBN 978-0520077553. Archived from the original on 6 March 2014. ^ Boardman, John (18 January 2001). The Oxford illustrated history of the Roman world. pp. 84ff. ISBN 978-0192854360. Retrieved 10 August 2011. ^ Anthony Everitt (2003). Ciceo: The Life and Times of Rome's Greatest Orator. Random House. 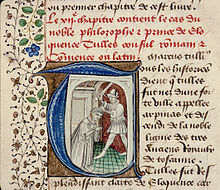 p. 115-16. ^ Yelegaonkar, Dr Shrikant (2009). Western Thinker's in Political Science. Lulu.com. ISBN 978-1329082779. ^ Goodey, C.F. (2013). A History of Intelligence and 'Intellectual Disability': The Shaping of Psychology in Early Modern Europe. Ashgate Publishing. ISBN 978-1409482352. ^ Powell, Jim (2000). The Triumph of Liberty: A 2,000 Year History Told Through the Lives of Freedom's Greatest Champions. Free Press. pp. 2–10. ISBN 978-0684859675. ^ Spielvogel, Jackson (2011). Western Civilization since 1300. Cengage Learning. p. 492. ISBN 978-1111342197. ^ Steel, C.E.W. (2013). The Cambridge Companion to Cicero. Cambridge University Press. p. 356. ISBN 978-0521509930. Caldwell, Taylor (1965). A Pillar of Iron. New York: Doubleday & Company. ISBN 978-0385053037. Everitt, Anthony (2001). Cicero: the life and times of Rome's greatest politician. New York: Random House. ISBN 978-0375507465. Narducci, Emanuele (2009). Cicerone. La parola e la politica. Laterza. ISBN 978-8842076056. Cicero: A Portrait (Allen Lane, Penguin Books Ltd., 1975) ISBN 0713908645. Revised edition: Bristol Classical Press, 1983. ISBN 0862920515. American edition of revised edition: Cornell University Press, 1983. ISBN 0801416280 (hardcover); ISBN 0801492564 (paperback). Richards, Carl J. (2010). Why We're All Romans: The Roman Contribution to the Western World. Rowman & Littlefield. ISBN 978-0742567788. Yates, Frances A. (1974). The Art of Memory. Chicago: University of Chicago Press. ISBN 978-0226950013. Everitt, Anthony (2001). Cicero. A turbulent life. London: John Murray Publishers. ISBN 978-0719554933. Fuhrmann, Manfred (1992). Cicero and the Roman Republic. Oxford: Blackwell. ISBN 978-0631178798. Habicht, Christian (1990). Cicero the politician. Baltimore: Johns Hopkins University Press. ISBN 978-0801838729. Macdonald, C. (1986). De imperio (Nachdr. d. Ausg. Basingstoke 1966. ed.). Bristol: Bristol Classical Press. ISBN 978-0862921828. Palmer, Tom G. (2008). "Cicero (106–43 B.C.)". In Hamowy, Ronald. The Encyclopedia of Libertarianism. The Encyclopedia of Libertarianism. Thousand Oaks, CA: SAGE; Cato Institute. p. 63. doi:10.4135/9781412965811.n42. ISBN 978-1412965804. LCCN 2008009151. OCLC 750831024. Parenti, Michael (2004). The Assassination of Julius Caesar: A People's History of Ancient Rome. New York: The New Press. ISBN 978-1565849426. Powell, J.G.F., ed. (1995). 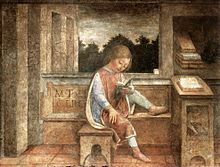 Cicero the philosopher : twelve papers. Oxford: Clarendon Press. ISBN 978-0198147510. Shackleton Bailey, D. R. (1971). Cicero. London: Duckworth. ISBN 978-0715605745. 106 BC - 43 BC. A Roman statesman, lawyer, political theorist, and philosopher. Cicero is widely considered one of Rome's greatest orators and prose stylists.